Until this week, we didn’t know a whole lot about William M. Robertson, oldest son of my 2nd great grandparents, Gustavus and Isabella Robertson. 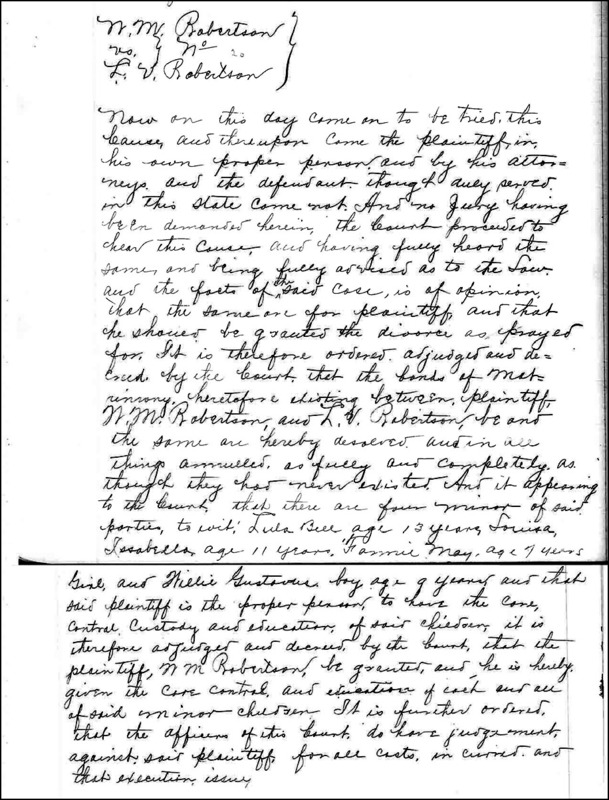 In 1889, he executed his last deed ever in Delta County and, in it, he and his wife Louisa Victoria said they were of Wilbarger County.3 And there the trail went cold. 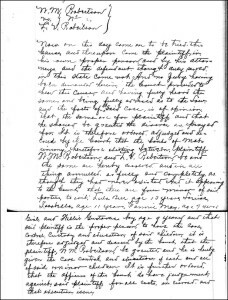 We had notes from Mildred Pittman Hendrix, wife of William’s nephew Amos Dewey Hendrix, that William had had four children, three girls and a boy.4 But we couldn’t confirm it — the only one we knew of for certain was Lula Bell, the girl shown in the 1880 census. And we didn’t know what had happened to her. Then a great grandson of William’s — a grandson of Lula Belle — took the AncestryDNA test. We’ve been in touch with him since the results came in, but he didn’t know of any siblings for Lula and had only heard stories that William died and Louisa Victoria remarried a man named Miller. He didn’t know her maiden name. Those notes placed William in Hall County in the early 1890s, and we were off on the hunt again. Thank heavens for good solid researchers. Lynn Parent got the Texas General Land Office records of William’s (and Gustavus’ and Jasper’s) land grants in Hall County for us. We hadn’t had a clue that Gustavus and Jasper had also been in Hall County in the early 1890s. And just this week Kelvin Meyers hit the jackpot for us with boots on the ground in Hall County. William didn’t die in Hall County. He and Louisa Victoria divorced there, in 1891. The original divorce file — gone. But oh are we ever grateful to the meticulous clerk who noted in the court minutes of 17 November 1891 that the divorce had been granted, at William’s request. Isn’t it “funny” how an answer created two new questions? A lot more than two!!! I think it’s more of a geometric progression, Jeanette — growing like Topsy! My aunt, Nelle Weldon Sandel Booth, told me the story of trying to stop the train at Memphis, Tx. by greasing the track,and said the Post Office there used to have a mural in it depicting the episode. I went there in the 70’s but found nothing about it in the library. Lula Belle was my grandmother and I lived a short time with her in El Paso, TX. about 1943 when she was married to her 2nd husband, Fred Gilman, who had emigrated here from England. I thank Judy Russell for making me aware of other children of William and Louisa as I thought my grandmother was the only child. I recently went to Lordsburg,NM and found the unmarked grave of William G. Robertson,Lula Belle’s younger brother. Good to “see” you here, Richard! I was more than a little curious when you opened this thread with, “William M. Robertson, oldest son of my 2nd great grandparents, Gustavus and Isabella Robertson”. Considering that Gustavus’ father was also William M. Robertson. From what I read in the history above, these seemed to be very poor folks that were living hand to mouth. It’s no wonder we don’t have more information about William Sr. Someday perhaps. I’m sure this William was named for his paternal grandfather, Michael. It’s a typical Scots-Irish naming pattern, especially when you consider that the second son was at least in part named after his maternal grandfather. But I’m not so sure these were poor folks. William M. the elder owned a hat shop and at least one slave in Lowndes County, bought land in Winston County, etc. We’d be a lot further along chasing this dude if (a) his parents had given him a first name like Zephaniah 🙂 and (b) so many of the area courthouses hadn’t burned. I’d be interested to know if there were any divorce files that old in Hall County at all. Generally, only the court proceeding were noted. I’ve found supporting evidence in deeds that show property division between man and wife. Older county court records that I have viewed in Texas were cryptic. One major murder trial contained jury lists and sheriffs returns which supported what the daily newspaper accounts stated. Out of 75 pages, only the last three had an appeal judgement written by the appellate court judge included. Not even the original judgement was included. I don’t think the case files were still extant; the divorce info came from the court records.